MARRIOTT’S Global Customer Appreciation Week has become a pillar of the company’s culture in which, each year, properties thank their loyal customers for their business. Across the world the week is celebrated with activities such as customer roadshows and Marriott’s own ‘spirit to serve’ initiatives. 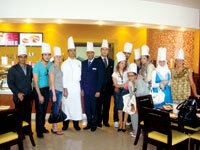 At Marriott Executive Apartments Bahrain staff used the week as a platform to launch its ‘Spirit to Serve the Hungry’. Working together with World Food Programme (WFP), the property invited its guests and residents to donate half a dinar ($1.30) to help WFP provide free meals for millions of children in the world’s poorest countries. As part of Spirit to Serve a group of students from New York Institute of Technology (pictured) visited the property to learn closely about interior designs implemented in the [email protected] Café and ktchen.